Rossvale overcame injuries and holidays to claim a point from their opening game in the new West Championship at Darvel on Saturday. The visitors struggled to field a strong team due to unavailability and it was Darvel who started on the front foot. In the second minute Mark Armour fired over a cross which found Paul Hewitt in the box and his header flashed past the post. Stewart Davidson then almost scored five minutes later when his free-kick from edge of box crashed off the Rossvale crossbar and out for a bye-kick. Darvel were testing the stretched Vale defence and Jenkins brought out a great fingertip save from Jamie Donnelly. But Rossvale went straight up the park and Chris Zok brought the ball down and held off the defender and laid on an inch perfect pass for an onrushing Gary McMenamin whose shot went narrowly past the post. 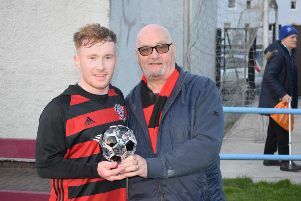 David Leadbetter then broke down the left and played a through ball for Andy Johnstone to run onto and leave him one on one with David Markey in the Darvel goals, but his shot flew over the crossbar. Perhaps against the run of play Vale then took the lead. Zok won the ball just inside his half and fired a high cross to the back post which the keeper appeared to fumble and Jamie Hunter bundled it over the line. However Sean Fitzharris brought the teams equal 10 minutes later with one of the freakiest goals of the season. He won the ball just inside the ‘Vale half and seemed to fire in a shot on goal which Donnelly had well covered at his near post. But at the last second the ball hit one of the many bumps on the park and finished up going in at the back post, leaving Donnelly wondering it happened. The second half was mainly balls being fired from one end of the park to the other and back with not a lot of football being played and both keepers not having much to do except kick long balls. Going into the last 10 minutes Vale picked up their game at last and started to move the ball about better. Young Josh O’Hare, who had just come on, had a hard game on his hands looking after the experienced Jenkins but he stuck to his task and closed him down and kept him quiet. With five minutes to go McGladrigan thought he had done enough to turn the ball over the line but the referee deemed it hadn’t and waved play on. Darvel nearly caused their own downfall when Calum Walsh was slack with a backpass to Markey with McGladrigan closing it down he had to be sharp off his line to clear the ball out for a throw-in. With a couple of minutes to go Markey brought off an excellent save from an O’Hare thunderous header and then turned away an Anton McDowell rebound shot at the near post to deny Vale all three points. Next up for Rossvale is a home clash with Kilsyth Rangers on Wednesday night. Fans going to this one are advised to leave themselves plenty of time as roads closures and diversions will be in place due to the Glasgow 2018 cycling race.